Javeri's father died a few years aho, and her mother is a daily wage worker who does not make much money. It is hard for the family to make enough for food and education. 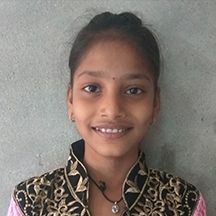 Javeri is a clever girl who works hard in school. Sponsorship would provide Javeri with an education and basic needs.